Multiple application settings per application - When we need to maintain different-different application specific settings based on the application environment. Say, one can have one type of application settings for Development, another type of application settings for Production, another one for Staging, and so on. Needless to mention, all the appsettings file will have different names. To implement inheritance – If there are some common settings between multiple application settings file, in that case developer can come up with a base application settings file and on top of that specific file can be created. In that case, common information need not to be repeated in all the files. If you are aware about the ASP.NET Core architecture, then you must agree on the point that, such scenarios can also be handled very easily in the ASP.Net Core as plugging multiple sources is very straight forward. So, coming to the point. 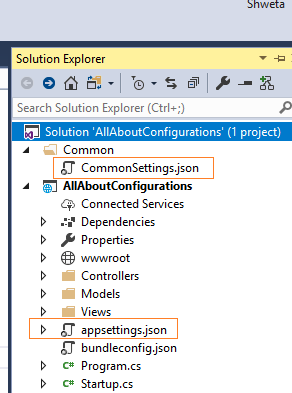 My this article is all about how to inherit or say read data from appsettings.json file which is outside my project. This scenario usually comes into the picture, when we are maintaining different project for holding all the shared resources, that has to be consumed across many projects in a given solution file. So, in the real world, one project can have its project specific settings as well as some common (or say global) settings which is placed outside its boundary. Now if you will run your application, you will be able to see that both the settings are considered as part of single project.